Last week’s Moorestown Board of Education meeting was all about the students, as students from the Upper Elementary School to the high school were honored for their accomplishments. The meeting held a Pageant of Success for students who accomplished great things in various areas from the arts to science. The Sun spoke to Moorestown High School teacher Richard Wilczewski about his class that presented their projects to NASA and was honored at the meeting that night. “Pageant of Success is always a wonderful time to celebrate our students,” Interim Superintendent Carole Butler said. Wilczewski teaches a science class at the high school called Innovative Conceptual Engineering Design. ICED was started in conjunction with Charles Camarda of NASA’s program called Epic Challenge, where students are encouraged to develop their scientific understanding and skills by coming up with creative solutions to real-world problems. “I thought we could bring this program (originally for college students) to young students of all ages and engage them and motivate them on how to use creativity and critical thinking to come up with innovative ideas to solve,” Camarda said. “When you put different people on a problem, you can come up with some very innovative solutions,” Wilczewski said. This year’s challenge was about how they would colonize Mars. What makes Wilczewski’s course unique is he allows the students to decide what they would like to do their project on. Students’ projects ranged from travel with antimatter, to bringing livestock to Mars, to architecture and insulation needs. 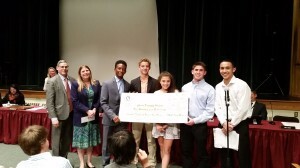 For their hard work, MHS was one of a few high schools invited by Camarda to NASA’s Langley Research Center in Hampton, Va., where students presented the findings of their research. Through Moorestown Educational Foundation donating $4,000 for the trip and fundraising, students Mary Cervantes, Melvin Sheppard, Hunter Smith, Magan Steinagle, Ryan Wenzler, Alexis E Angelini, Reeves Balderson, Alex Bewley, Alexandria Alberic-Brown, James Adams, Olivia Alvarez, Lawson Hayes, Muhammad Khalid, Karla Peterson and Nicholas Venti presented their findings live to a board of engineers, Ph.D.s and an astronaut. Additional students shared with NASA via YouTube. Their presentation was streamed live around the world and was viewed by people in the United States and Finland. “I felt very privileged because I know a lot of students don’t get the chance to do this type of program and have these types of experiences,” Smith said. All students greatly appreciated and benefitted from the visit, saying they never thought they would get the opportunity, and the class really bonded over the experience. “We all benefitted from that in indescribable ways. How many people can say in their high school career they got to talk to head engineers of NASA and had them listen to their ideas and take their ideas on board? It made you feel like you had power to change what was going on in the world,” Smith said. Wilczewski and students in the class said they were honored to be recognized at the Moorestown BOE meeting, and Wilczeweski and Camarda thanked the BOE for allowing programs such as this at Moorestown schools. 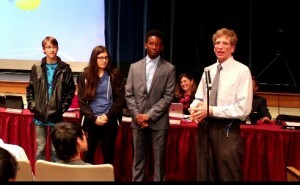 “I commended them and thanked them as a community and school district for being progressive enough to take a chance on inspiring and educating students,” Camarda said. “This class is inspiring; I feel like it is inspiring the next leaders of the world and inspiring kids to take on those responsibilities and expectations. I feel like it will benefit careers and jobs in the long run,” Smith said. “Things like (this class) don’t go noticed that often. I felt honored, though I couldn’t go, that we were recognized,” Wenzler said. To see more videos about the class, the students’ projects and the recognition at the BOE meeting, visit www.youtube.com and search MrWilczewski. More high school students in the district were honored for their success at last week’s board meeting as well. Students were acknowledged for performing arts, visual arts, High School Strategic Planning Committee, high school science, national Latin exam, national French contest and national Spanish examinations. In William Allen Middle School, students were recognized for performing arts, Burlington County Teen Arts Awards, national Latin exam, national French contest, national Spanish examinations and John Hopkins Youth Talent Search. UES students were honored for being in the All South Jersey Elementary Honors Band, All South Jersey Junior High Band, All South Jersey Junior High Orchestra, All South Jersey Elementary Honors String Ensemble, All-State Intermediate Orchestra and South Jersey Choral Directors Association Elementary Chorus. For a full list of categories and those honored at the BOE meeting, visit the Moorestown Township Public Schools website at www.mtps.com, go to the BOE tab and click Meeting Documents. • The MHS Student Council held a talent show and from the proceeds each class received a portion of the funds. The senior class also chose a charity to donate to, which was Pennies From Melvin. All money raised by the charity benefits Cooper University Hospital. Doctors from Cooper Hospital were on hand to receive the $500 donation at the meeting. • Scott McCartney, the superintendent who will begin on July 1, attended the meeting. After an introduction at the beginning of the meeting, he formally thanked the BOE and the Moorestown community for his upcoming appointment. • The BOE is looking over the resumes it received from community members interested in serving on the BOE. The BOE members will interview potential candidates and choose two people to fill empty seats. The board hopes to have that accomplished by the June BOE meeting, which will be held on Tuesday, June 21 at 7:30 p.m. at the WMAS Media Center.